How did we grow one of the largest tourism Facebook audiences? Adirondack.net uses its Facebook page as a channel for sharing content that can start a conversation with its audience and drive relevant users to its website and ultimately to grow tourism. The challenge is not to grow fans but to was to build a fan base with highly engaged fans. Quality over quantity, as the saying goes. This is the ad that appeared in desktop news feeds of users who had recently visited Adirondack.net but were not yet following the Adirondacks Facebook page. We also ran an ad that appeared in the mobile news feed. We ran a 1-week Facebook advertising campaign designed to increase the number of qualified users following the Adirondacks’ Facebook page. This social media marketing campaign revealed some profound insights on the effectiveness of using Facebook advertising for business and helped the Adirondacks Facebook page gain 400 new followers in a relatively short amount of time. How we did it… Retargeting! 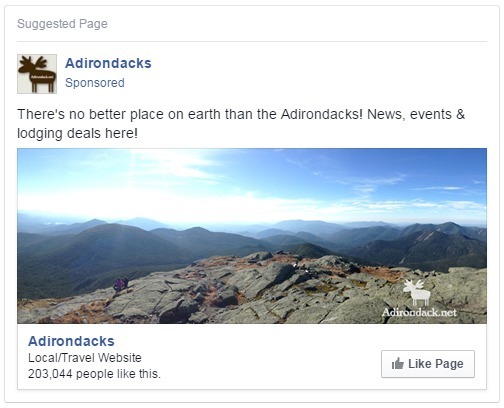 Using a technique called “retargeting,” the Facebook ad campaign was geared towards people who had recently visited Adirondack.net. Because these users had already visited the website, one could suggest that they’d also be interested in the type of content posted on the Adirondacks Facebook page (e.g. news, events, deals, and more). The goal, then, was to encourage these users to follow the Adirondacks Facebook page so that they could start seeing new posts from that page in their news feed. Before launching the campaign, we followed several key steps in the set-up process. These included: (1) Adding tracking pixels to our website, (2) Creating custom audiences, (3) Selecting targeting factors, (4) Designing an attention-grabbing ad, and (5) Setting an advertising budget. In the days leading up to the campaign, the Adirondacks Facebook page was getting a mere 7.2 page Likes per day — <.during the campaign, they were gaining 57.3 page Likes per day. That’s a 696% increase in page likes. We also saw a substantial increase in reach and engagement. Retargeting and remarketing are one of the strongest forms of advertising for businesses with a strong web presence. 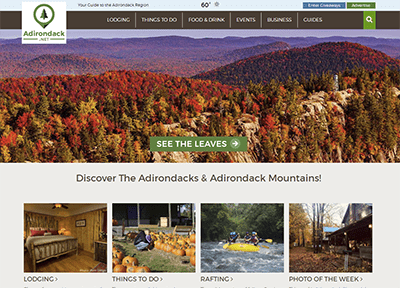 By targeting visitors to Adirondack.net, we saw an immense impact on engagement, which increases reach and makes it easier to grow our social media presence. Sara Mannix | Adirondack.net by Mannix Marketing, Inc.